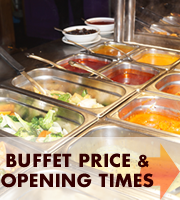 Oriental buffet offers diners an amazingly diverse menu featuring over fifty dishes from all over the oriental including China, Thailand, Malaysia, Nepal and India. We offer relaxed buffet format which allow you to sample as many delicious disches as you please from constantly changing selection of starters, main courses, desserts as well as a healthy salad bar. The simplicity of the buffet layout allows you to walk through the buffet display choosing from the selection of green salad or mouth-watering starters including Crispy duck, Salt and pepper King Prawn, Seawoods etc. The freedom of buffet is to make as many trips as you like no matter where you wish to start. The main course includes selection of Chinese fried noodles to Singaporean fried rice noodles, Indian curries to Thai green curries, a few selections of Indian & Chinese vegetarian dishes, extensive selection of tender beef and chicken cooked Chinese style with different sauce such as black bean, sweat & sour, black pepper and oyster sauce. Your dessert includes the selection of Ice cream and Gateaux with fresh Fruit salad. Yes ofcourse you can eat as much as you wish but still pay a fixed price. Quality: We strive to achieve Quality in everything we do and define Quality as customer satisfaction. We believe the Quality of the Food and Customer service to be our biggest asset and are the security of our business and its future. Variety: Even with the diverse menu on offer, we believe our customers need choice & variety irrespective of the fixed price they pay. This is the most important aspect of our buffet concept. We ensure that the menus and ideas are refreshed .Our Chefs are continually inspired to innovate for the creation on new delicacies to delight the customers and spoil you with the choice of the cuisines. Value: We are a family run business where customer satisfaction, innovation and employee satisfaction is as important as profit. We strive to provide the highest quality of food and service at competitive and affordable prices thus creating value for your money. Authenticity: We use the finest ingredients from the Orient and yes our chefs are all trained in the Orient to offer you the authentic oriental cuisines all under one roof. 1 Huge variety up to 50 dishes available. 2 Cuisine from China, Malaysia, Thailand, Singapore, India and Nepal. 7 Private parties and celebrations welcome. Feedback What our customer saying about us!